Our April meeting in Denver and Boulder will include a short presentation by Joseph Karuna. 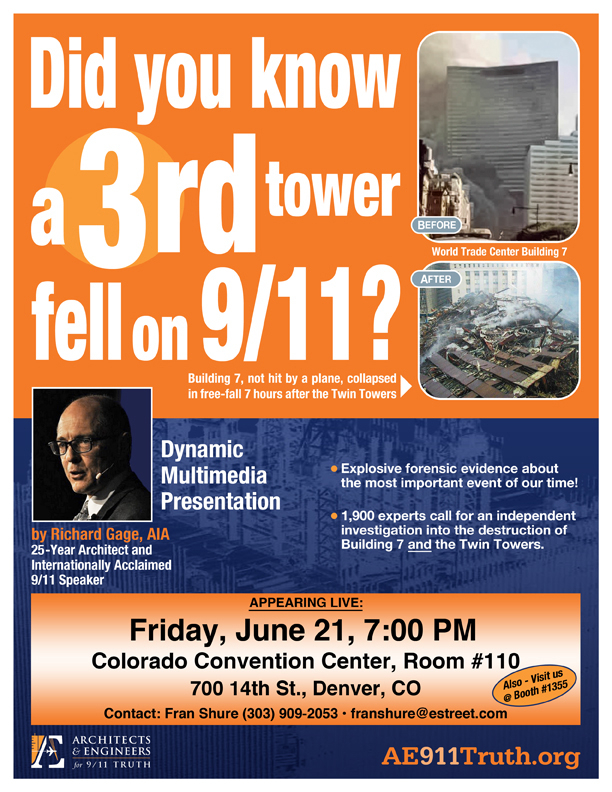 Joseph has assembled an impressive packet of 9/11 educational materials that he presented this month to many well-placed officials at the National Conference on Media Reform in Denver and the Conference on World Affairs in Boulder. He will have packets available for a donation. Following this, Denver will screen the excellent and hard-hitting documentary by Scott Noble, The Power Principle Part II: Propaganda (1 hour, 40 minutes), and Boulder will screen the new documentary by Adnan Zuberi, 9/11 In the Academic Community: Academia’s Treatment of Critical Perspectives on 9/11 (1 hour). We will provide copies of The Power Principle Part II: Propaganda to attendees in Boulder. Grand Junction will screen The Power Principle Part II. Denver and Grand Junction Film: In his documentary trilogy The Power Principle, Scott Noble, focusing on the last 70 years, does not soft-pedal his historical account of how the U. S. empire was constructed. Part I: Empire documents how U.S. foreign policy, whether under Republican or Democratic regimes, is based on (1) the interests of major corporations and a tiny elite to increase profits and (2) the U.S. government’s interests in maintaining and expanding its imperialistic influence. Part III: Apocalypse details how externally–and increasingly internally–this has caused massive poverty and suffering, genocide, war, coups, crushed unions and popular movements, and environmental destruction.